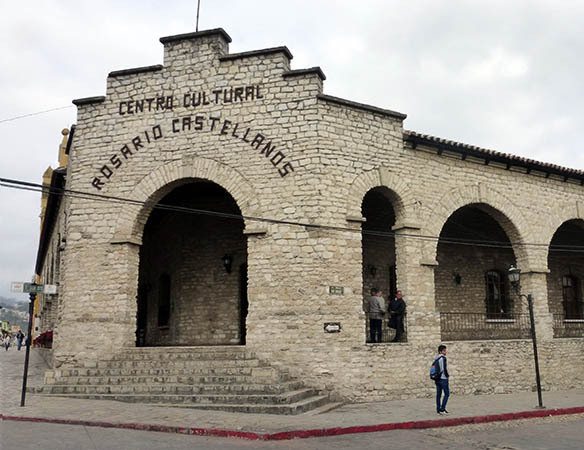 Attached to the church on the Plaza in Comitan is the Centro Cultural Rosario Castellanos. Built on the grounds of the former Dominican convent, the beautiful stone building now offers dance or marimba classes. 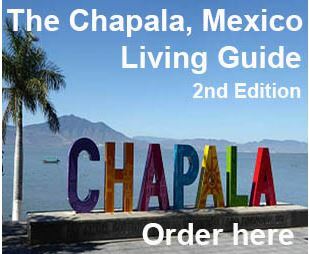 You can visit the cafeteria, library or admire the view of the convent from the colorful and well-maintained patio. 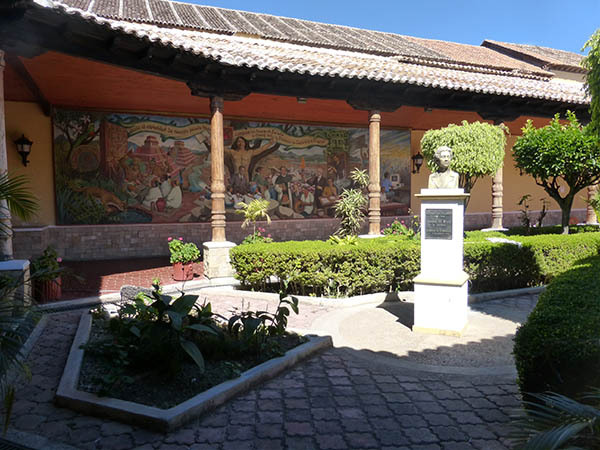 Inside the old Dominican convent, there is a beautiful patio surrounded by manicured gardens. On the wall there is a mural of the town's local history. 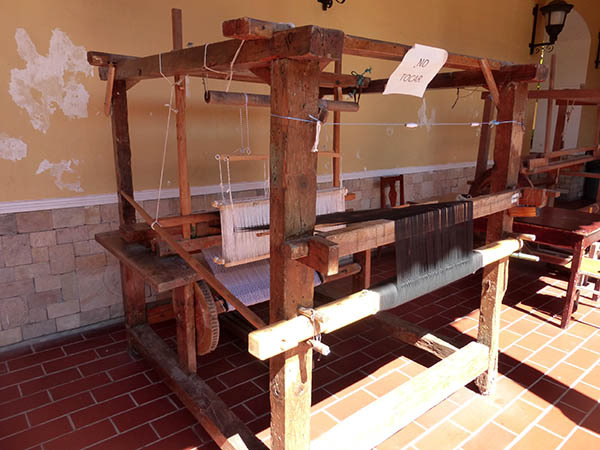 The sign attached to the top of the loom reads: "Do not touch." I wondered aloud to Billy if this loom was still operable. 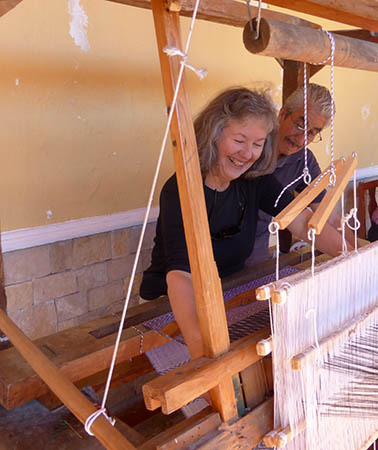 It was all threaded and set up for making a very long stretch of cloth (called rebozo), but I thought perhaps that was just for display. Before I knew it, this man came up to answer my question. YES! This loom is operable. Would we like to see how it works? 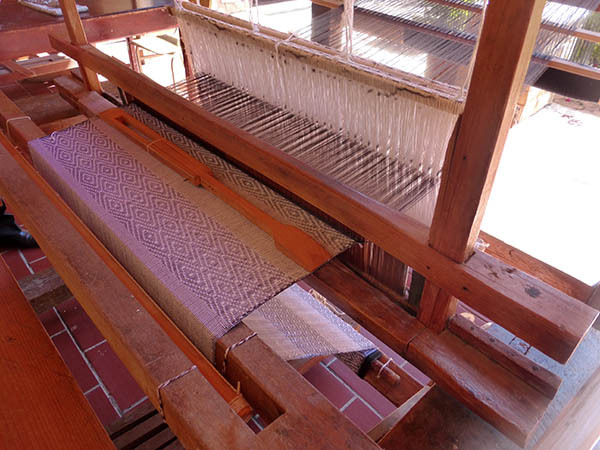 The warp threads are the black ones and the needle passes through these to create the weft threads and therefore, the pattern. As the pedals are pushed, different strings lift or fall down. 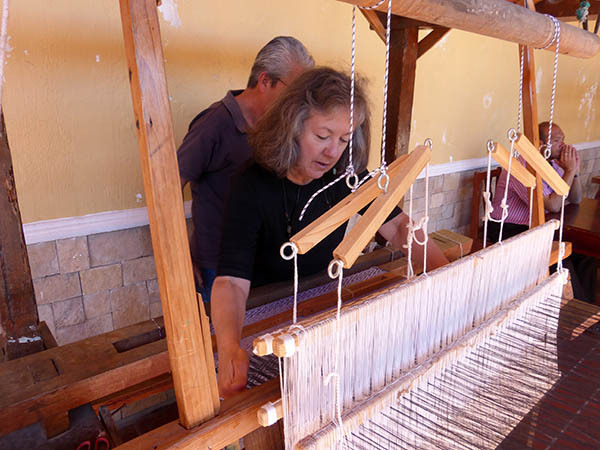 A smaller spindle is "thrown" from side to side while the fibers are caught in between. I can't imagine how this machine was threaded in order to compose this complex pattern. I have no idea how this works or how someone figures it out. 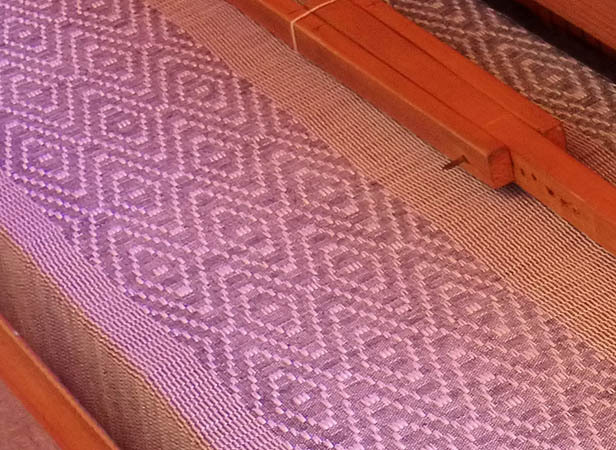 You can see how much of the cloth has already been woven by looking at the larger spindle at the bottom. As I was soon to find out, this diamond pattern took certain foot pedal placements in order for it to be created. Initially, it was the 1st and 4th pedal down, then 1st and 3rd, then 3rd and 4th and so on, until the diamond rose up. At some point, the pedals were in reverse order and the Master Weaver knew the pedal sequence by heart. Here you see the Master Weaver explaining how the pattern is created. 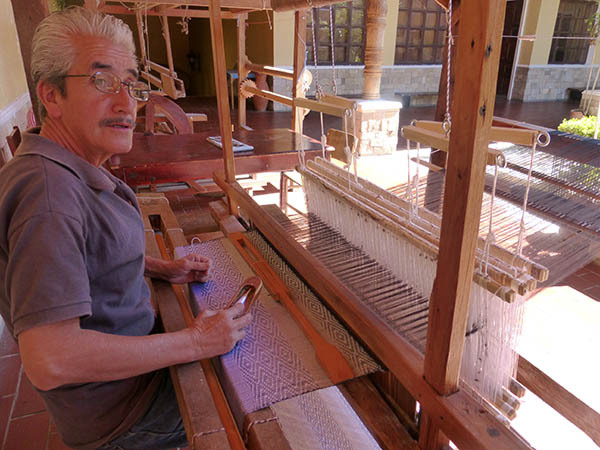 He was very meticulous and seemed entranced by the weaving itself. You could tell he loved this work. 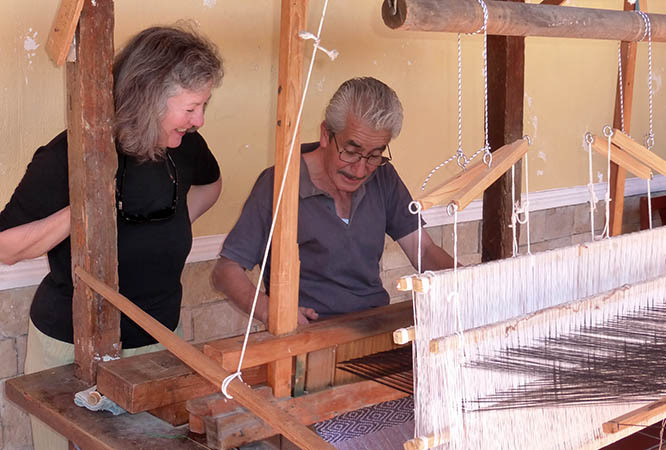 With great speed and dexterity this man propelled his weaving spindle through the black threads. His feet were holding down the foot pedals below in a specially devised order for the pattern to appear. He showed such grace and skill I began to literally laugh with joy and wonder. It hadn't crossed my mind that weaving was this complex nor did I realize that it took so much coordination between eyes, hands and feet. Oh my gosh, now it's my turn! I know, I know, the idea of weaving must be thrilling to you, but I love textile art. When he asked me if I would actually like to try to do this on a 200 year old machine, I readily accepted. I was nervous and discombobulated. All directions were in Spanish and this man was very patient as I slowly went through the paces of whisking that spindle through the threads and pressing down the foot pedals. My first few attempts of whipping the spindle through the black threads were abysmal. Several times I got locked up in a few fibers, or only made it one-third of the way across. The next time I threw it so forcefully that it almost went to the loom next door. The Master weaver caught it for me as it left the designated weaving area. I did not have the right feel just yet. Eventually it all came together and I was less and less afraid that I would break the machine, snag up the pattern or lose the spindle. 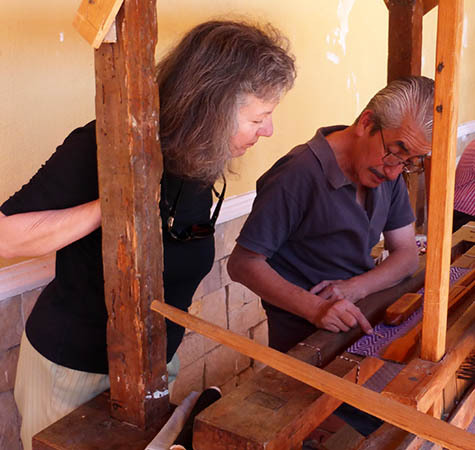 The Master Weaver was gracious enough to tell me I was a "quick learner." I returned his compliment with a smile of relief. 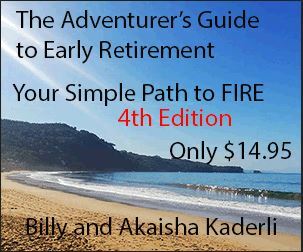 Even though it wasn't quite like white water rafting, I was exhilarated and grateful for the opportunity. 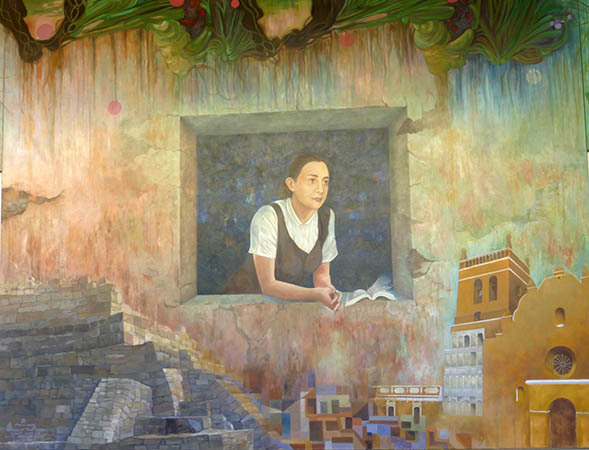 The mural in the Cultural Center depicts the history of Chiapas and of Comitan. On the left you can see some Maya ruins, and on the right is the Church at the Plaza. Unfortunately, we don't know the significance of the woman in the window with her book. She could be someone famous, a girlfriend or wife, or she could portray the mood of the era.